So, you’ve been let go. Or you’ve been terminated, fired, downsized or dismissed. Pick your euphemism, the unhappy fact remains that one chapter in your employment history has ended. It’s unfortunate that you are back on the job hunt but you are smart and capable and will handle this challenge with grace and skill. Ideally, your employer has taken care to follow the reasonable notice period guidelines set out in the Employment Standards Act (ESA) to give you the time and/or resources needed to get back on your feet and facilitate your smooth workforce transition. Ideally, you and your employer remain on friendly terms and your resume has a glowing new reference. But what if your termination was less than amicable? What if the reasons for your dismissal were petty, or worse, discriminatory? What if your severance package or termination pay was less than adequate? 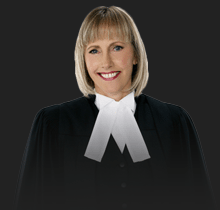 Does this mean you have been wrongfully – or unlawfully – dismissed? What’s the difference between the two anyways, and what recourse do you have? Simply put, a wrongful dismissal occurs when an employee is terminated without cause and without adequate notice or compensation. Being wrongfully dismissed has nothing to do with an employer’s reason (or lack thereof) for firing an employee. It unfortunately means that you can be fired for petty and unfair reasons, so long as you are given appropriate notice or termination pay. So yes, it is lawful to be fired because your boss doesn’t like your shoes. Generally speaking, employees can be dismissed without cause if they are provided with adequate notice of their termination or with compensation in lieu of said notice. The length of notice to which you are entitled is determined by your employment contract and minimum standards guaranteed by the ESA. If you have been dismissed without adequate notice or compensation, you may be able to sue for damages. You should know, however, that damages are meant to compensate you according to ESA standards. They are not meant to punish an employer for firing you. By contrast, a termination is unlawful if it is discriminatory under the Human Rights Code (HRC) or if it arises from you insisting on your rights under the ESA or Occupational Health and Safety Act. Legal actions may be pursued in the case of illegal terminations including being reinstated in your former position. 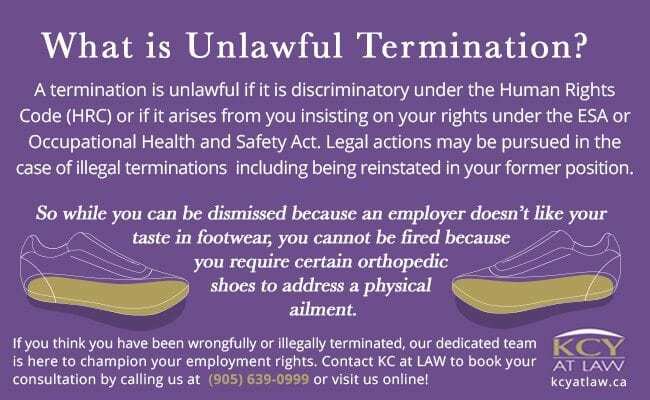 So while you can be dismissed because an employer doesn’t like your taste in footwear, you cannot be fired because you require certain orthopedic shoes to address a physical ailment. If you think you have been wrongfully or illegally terminated, our dedicated team is here to champion your employment rights. Contact KCY at LAW to book your consultation with a skilled employment lawyer who will defend your rights under the ESA and HRC. Call us at (905) 639-0999 or reach out to us online here. 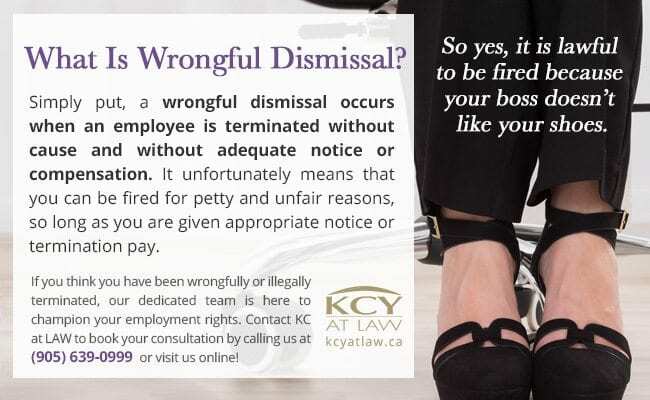 https://www.kcyatlaw.ca/wp-content/uploads/2017/04/Unlawful-vs-Wrongful-Dismissal.jpg 922 1321 Kathy Chittley-Young https://www.kcyatlaw.ca/wp-content/uploads/2018/01/KCY-at-LAW.svg Kathy Chittley-Young2017-04-26 15:26:242019-03-08 19:06:27Unlawful vs. Wrongful Dismissal: What’s the Difference?